One reason some with Lyme disease have a hard time recovering is due to Mold Toxin Illness. Some also have problems removing Lyme toxins. In this video and written article I describe the latest approaches to successfully diagnose and treat mold and lyme toxin illness. There is a theory promoted by Dr. Ritchie Shoemaker in his various publications including Mold Warriors and Surviving Mold and his online site that 25% of all people are unable to remove mold and/or Lyme toxins once they are exposed. Dr. Shoemaker developed an elaborate science around his theory. The basic idea is that 75% of people are able to transform mold and Lyme toxins from a fat-based form into a water-based form. In a water-based form, they are moved out into the intestines where they are pooped out. Due to a genetic predisposition (HLA-DR defect), however, 25% of people are unable to transform the fat toxin to a water toxin. So, they get moved from the liver to the intestines while still fat-soluble. In a fat-soluble form, they are then reabsorbed into the blood stream through the intestines. Thus, if a person is one of the 25%, they literally swim in toxins that keep triggering cytokines. Cytokines cause most Lyme symptoms. So Mold and Lyme Toxin Illness can look identical to Lyme disease. This can become worse as the result of killing Lyme, which releases toxins from the inside of the germ – adding more to the recirculating pool of toxins, triggering even more cytokines. Read more about cytokines and options to lower them in Control Cytokines: A Guide to Fix Lyme Symptoms & The Immune System. Adding to the complexity of Mold Toxin Illness is the work of Joseph Brewer, M.D., an infectious disease specialist. His study of patients with chronic fatigue syndrome found 93% were positive for one or more of the following mycotoxins in their urine: ochratoxin A, aflatoxin, and trichothecene (black mold toxins). In later work, Dr. Brewer theorizes an ongoing source for mold toxins is colonization of the sinus passages in individuals who have lived in water- damaged buildings. His detailed review of the literature supports this theory. In his presentation to the 2013 International Lyme and Associated Diseases annual scientific conference in San Diego, Dr. Brewer presented his unpublished findings supporting the benefits of treating mold colonization with nasal irrigation using antifungals, oral antifungals, and fat binders (to bind fat toxins) like cholestyramine. He noted that benefit was only observed with ongoing months of treatment to eradicate mold. This video was recorded during Conversations with Marty Ross MD in November 2016 when Dr. Ross practiced in Seattle, Washington. To see if a person has mold or Lyme toxin illness, do a Visual Contrast Screen (VCS). This is a test a person takes perform on their computer or in a physicians office. The test involves looking at a number of images that have various degrees of black, white, and grey. A person who cannot remove Lyme and/or mold toxins will have a hard time distinguishing black, white, and grey on this test. If you fail the test, then you could have mold or Lyme toxin illness. Be aware the test is not perfect. People can pass the test occasionally who still have this illness. Dr. Shoemaker has the test available at his website. According to Dr. Shoemaker, there is a genetic profile for those that are unable to remove mold and/or Lyme toxins. The genetic profile is determined through a blood HLA-DR test. I use to perform this test on my patients in my Seattle practice but found that it is not entirely accurate. Sometimes it would suggest a person has the problem and treatment would not work. And at other times it would suggest a person did not have the problem, but I would treat based on my clinical suspicion of the illness and treatment would work. The test is also expensive. For these reasons I do not like this test. Real Time Labs in Texas performs a test on urine to see if a person has mold toxins. They can detect 15 different types of mold toxins that fall into 4 different classes. 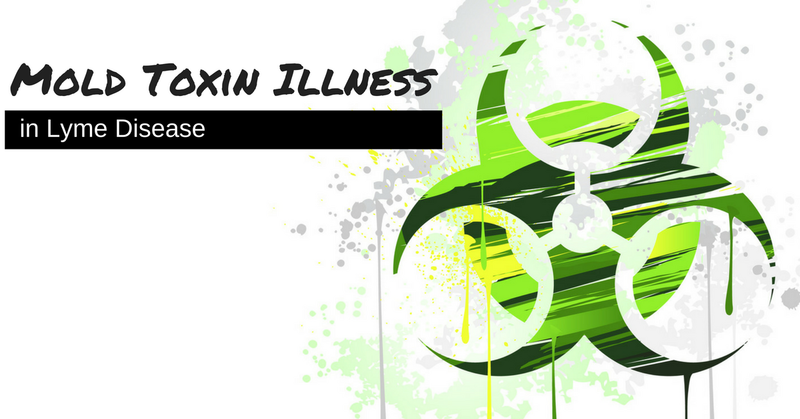 These 4 mold classes are ochratoxin, aflatoxin, tricocethene (black mold toxin), and gliotoxin. This test is a game changer for me. During mold toxin treatments it helps to diagnose a problem, pick the proper treatment based on the toxins detected, and see if the treatment is working. There are two downsides to this lab. First it does not detect Lyme toxins. It is also rather expensive, although repeat testing is 1/4 of the cost of the initial test. Be aware gliotoxin can also come from candida yeast overgrowth in the intestines. So a person should consider if they have this problem too to decide if the gliotoxins are from a wet building or from their intestines. See A Silent Problem. Do You Have Yeast? There are a number of binders that pull the toxins out of the intestines so they are not reabsorbed. The best general binders are the prescription cholestyramine or the soluble fiber which is available as a supplement called fractionated pectin. Clinically these remove Lyme toxins and the various types of mold toxins. It is possible to give a trial of one of these for one to two months before trying a more specific binder based on urine testing from Real Time Labs. Different binders work better on certain toxins than others. Ochratoxins are bound best by cholestyramine and activated charcoal. Aflatoxins are bound best by activated charcoal and betonite clay. Tricocethenes are bound best by activated charcoal, but cholestyramine, pectin, charcoal and betonite clay can help. And gliotoxins are bound best by betonite clay. Brewers' work shows that some with mold toxin illness remain ill because their mucous membranes in the sinuses and intestines become colonized with mold. If binders do not work at removing mold toxins, then it is time to use antifungal prescriptions to kill mold in the sinus passages and the intestines. For the intestines I like prescription itraconazole works best. For the sinuses nose sprays of nystatin, itraconazole, or amphoteracin b can work well. Note it can take months to to even a year or more to get rid of mold from colonized nasal passages and the intestines. Trial of General Binders Without Testing. If there is a high probability mold toxin illness based on a history of obvious mold exposures do a 1 to 2 month trial of binders. Another option is to use a 1-2 month trial of binders to remove Lyme toxins alone at 6-9 months into treatment if someone is not improving. The strongest treatment is to use the cholestyramine. It is best to use this to see if treatment will work. However, soluble fiber is a nutritional supplement option that can help too. In addition, once a person is doing better, they can use the soluble fiber to maintain the improvements. When doing this find the minimal daily dose (ie. 1-4 scoops a day) that works best. Note: Removing toxins can cause a greater production of inflammatory cytokines that could make a person feel worse at first. Before and during the treatment use curcumin to lower the cytokines. For additional steps you can take to lower cytokines see Control Cytokines: A Guide to Fix Lyme Symptoms & The Immune System. Fractionated Pectin Powder 1 scoop 2 to 4 times a day. Curcumin 500mg 1 pill 3 times a day. Begin 1 week prior to starting either the fractionated pectin powder or cholestyramine and continue taking it during the first 1-2 months of treatment for the biotoxins. Cholestyramine. This is a prescription medicine. Take 1 scoop daily. Every 7 days increase by 1 scoop till you are taking 1 scoop 3 times a day. Do not take with medicines or supplements beginning 30 min before taking the cholestyramine through 2 hours after. You can eat anytime, but the ideal time is 30 minutes after taking the cholestyramine. If the general binders do not work, get a Real Times Lab test and choose binders based on the test results. See Specific Binders in the article above. Betonite Clay 500mg 1 pill 1 time a day. Every 7 days increase by 1 pill a day till taking 1 pill 3 times a day. If you flare do not increase until the flare passes. Do not take with medicines or supplements beginning 30 min before taking the clay through 2 hours after. Activated Charcoal 500mg 1 pill 1 time a day. Every 7 days increase by 1 pill a day till taking 1 pill 3 times a day. If you flare do not increase until the flare passes. Do not take with medicines or supplements beginning 30 min before taking the charcoal through 2 hours after. Curcumin 500mg 1 pill 3 times a day. Begin 1 week prior to starting binders and continue taking it during the first 1-2 months of treatment for the biotoxins. After 2 months of a specific binder, repeat the Real Times Lab. If the toxins remain, consider adding an antifungal treatment. Brewer JH et al., Detection of Mycotoxins in Patients with Chronic Fatigue Syndrome. Toxins 2013, 5, 605-617; doi:10.3390/toxins5040605. Brewer, JH et al., Chronic Illness Associated with Mold and Mycotoxins: Is Naso-sinus Fungal Biofilm the Culprit?Toxins 2014, 6, 66-80; doi 10.3390/toxins6010066. Nathan, Neil (2016). Mold and Mycotoxins: Current Evaluation and Treatment 2016. Pennsauken, NJ: BookBaby. Shoemaker, Ritchie (2005). Mold Warriors. Baltimore MD: Gateway Press. Shoemaker, Ritchie (2010). Surviving Mold. Baltimore, MD: Otter Bay Books. Should I Get the Flu Vaccine in Lyme Disease?